Wales could not have wished for a better start to their Six Nations campaign - an historic win against world champions England. This was only Wales' second victory against England in their history, and what a performance it was. I played in the first ever win over England at Taff's Well in 2009 and I said last week that this Welsh side could do the same. Yes, England were missing some key players and, yes, they've had a few retirements since being crowned world champions. But they still had eight players in the starting line-up who played at the World Cup - so take nothing away from Wales. They completely dominated, especially up front where the ball-carriers were superb. Fly-half Elinor Snowsill controlled the game well from behind, and Wales never looked like losing. They looked confident, and that came from a strong forward platform. The scrum was solid, the line-out was good and they strung a few phases together. During the World Cup, Wales tended to lose badly in the last 20 minutes but, against England, they played for 80 full minutes. Centre Gemma Rowland did superbly on her debut, while number eight Shona Powell-Hughes stood out along with the front row. The two props, Catrin Edwards and Caryl Thomas, carried and worked all afternoon, and they thoroughly deserved their win. I expect Wales to beat Scotland, particularly as that win over England will have given them so much confidence. Scotland lost heavily to France on the opening weekend, so Wales should be going up to Scotland fully believing they can win. They enjoyed a convincing 25-0 victory against the Scots last year, and I want to see them put in a similar performance on Saturday. 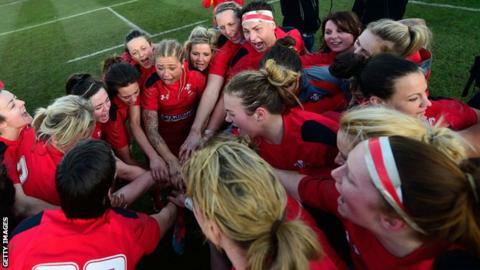 It's good to hear Wales captain Rachel Taylor saying the England win can't be a one-off and, if their opening win is anything to go by, Wales are more than capable of putting a few good results together. If they can start building momentum, anything is possible. A title tilt for Wales? Looking ahead to the rest of the Six Nations, the competition could open up nicely for Wales after beating England. France away is always a tough game - they have huge crowds, it's noisy and it's always difficult to win there. Wales will know all about that having lost 26-0 to the French on the opening day of last year's World Cup. Like England, France are without a number of players on sevens duty, but the reigning Six Nations champions will be one of the teams to beat this season. Travelling to Italy can be a tricky fixture as well - and they beat Wales last year - but I think Wales should go there with confidence this time. Ireland have been in a state of transition since the World Cup, but they'll be one of the strongest sides this year. Playing at home against the Irish will be a major advantage, but Wales can't look beyond Scotland yet. The Welsh players are right to be fully focused on that game, and another win could really put them in title contention. I think it's going to be a great Six Nations for Wales. Non Evans was speaking to BBC Wales Sport's Dafydd Pritchard.